Ms. Casby is an intellectual property attorney actively involved in acquiring patents and trademarks for clients, as well as handling disputes and litigation over intellectual property rights. She has significant expertise in resolving domain name disputes for trademark holders and business owners. Ms. Casby was named by her peers to the list of "2007 Rising Stars" in Southern California Super Lawyers magazine. Ms. Casby has extensive hands-on experience in the design and development of computer software. For almost 20 years, Ms. Casby designed and architected software and led software design teams on projects for defense, space, and commercial applications. Her programming career includes design and development of software for operating systems, embedded systems for military navigation, military command and control applications, commercial enterprise networking support software, and space program applications. Ms. Casby has managed teams of up to 20 programmers during her career as a software engineer, including responsibility for multimillion-dollar budgets. Her software career highlights include being the Technical Group Leader and Cognizant Design Engineer for the flight software of the Cassini spacecraft’s Command and Data subsystem during her six years working at NASA’s Jet Propulsion Laboratory (JPL). Cassini is presently performing a successful mission orbiting the planet Saturn. Qualifications: Ms. Casby holds a double Bachelor of Science degree in Computer Science and in Geology from the State University of New York (SUNY) Stony Brook University, as well as a Juris Doctor (J.D.) degree from the University of Kentucky College of Law. 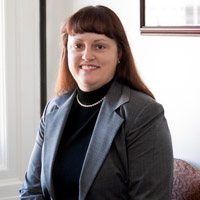 She is licensed to practice law in both California and Kentuky. Ms. Casby is registered as a patent attorney with the U.S. Patent and Trademark Office; and she is admitted to practice before the U.S. District Courts for the Northern, Central, and Southern Districts of California.